This article presents information necessary to assist in the choice and use of steel structures at the concept design stage for modern multi-storey buildings and single storey buildings . The information is presented in terms of the design strategy, anatomy of building design and structural systems. For multi-storey buildings the primary sector of interest is commercial buildings, but the same information may also be used in other sectors. For single storey buildings the primary sector of interest is industrial buildings, but the same information can also be used in other sectors, such as commercial, retail and leisure . 2.2.2 Simple roof beam, supported on columns. Speed of construction, which may influence the number of components that are used and the installation process. The benefit of using longer spans, at negligible extra cost, in order to enhance flexibility of layout. Services requirements and service integration. The requirements for building service distribution (from the building core). Column-free internal spans with columns located along the façade line. A building width of 13 to 20m provides sufficient natural light in the perimeter zones. Wider plan forms are not generally suitable for open plan office space. A zone equal to twice the floor to ceiling height from each façade walls may be naturally ventilated (typically 6 to 7m), and the inner zone has to be mechanically ventilated. 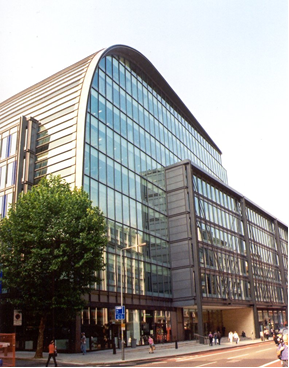 Atria provide an additional source of natural lighting and improve the energy use of the building. Speed of construction and site productivity. For taller buildings, strategically placed concrete or braced steel cores are usually adopted. Ultra tall buildings are influenced strongly by the stabilising system, but are not covered here. Sizes of lifts and their speed of movement also become important considerations for tall buildings. Depending on the Regulations for fire safety, the use of sprinklers may be required for buildings of more than eight storeys (or approximately 30 m high). The need to distribute the stabilizing systems (bracing and cores) effectively throughout the building plan. 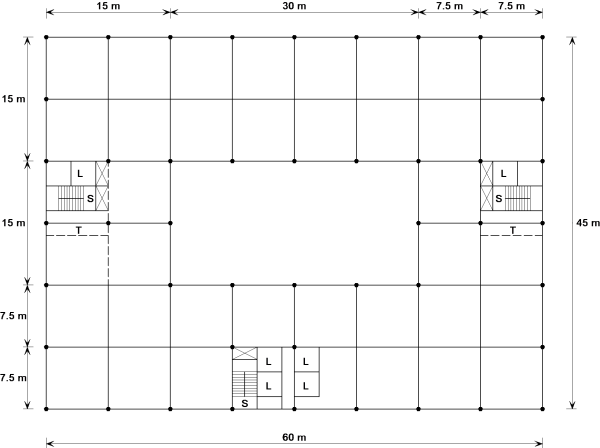 The two planning grids shown above present typical arrangements that satisfy these criteria. Light levels and servicing to internal offices. These targets permit a range of structural solutions. If, for planning reasons, it is required to limit the overall building height, this can be achieved by use of shallow floor or integrated beam systems. Integrated beam systems are often used in renovation projects where the floor-to-floor height is limited by compatibility with the existing building or façades. For concept design of orthodox commercial multi-storey steel structures , the following 'target' floor depths may be used. The structural system required for stability is primarily influenced by the building height. For buildings up to eight storeys height, the steel structure may be designed to provide stability, but for taller buildings, concrete or braced steel cores are more efficient structurally. The following structural systems may be considered for stability. For buildings up to four storeys high, rigid frames may be used in which the multiple beam to column connections provide bending resistance and stiffness to resist horizontal loads. This is generally only possible where the beams are relatively deep (400 mm to 500 mm) and where the column size is increased to resist the applied moments. Full depth end plate connections generally provide the necessary rigidity. 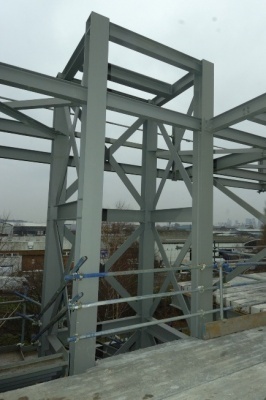 For buildings up to 12 storeys high, braced steel frames are commonly used in which cross, K or V bracing is used in the walls, generally within a cavity in the façades, or around stairs or other serviced zones. Cross bracing is designed in tension only (the other member being redundant). Cross bracing is often simple flat steel plate , but angle and channel sections may also be used. As soon as the steel bracing is connected (bolted), the structure is stable. Fire safety and robustness of the long span construction. A typical layout of beams around a concrete core is shown in the figure below, with the use of heavier beams at the corner of the core. A double beam may be required to minimise the structural depth at the corner of the cores. Braced steel cores may be used as an economic alternative where speed of construction is critical. Such cores are installed with the rest of the steelwork package. An example of a braced steel core is shown in the figure above middle. 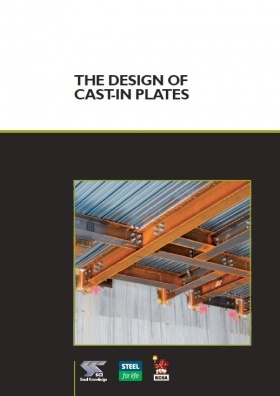 Guidance for the design of cast-in steel plates for connecting structural steel beams to concrete core walls is available in SCI-P416. This publication provides a model for the design of simple connections that transfer shear force due to permanent and variable loads and a non-coincident axial tie force resulting from an accidental load case. It points out additional issues which must be considered where coincident shear forces and axial forces are to be dealt with. A sample design of a simple connection for a 610 serial size UB is presented, and the design of punching shear reinforcement for the wall is included. The guide discusses the responsibilities of the building structural engineer and the steelwork contractor and suggests where the responsibilities are best divided. It also considers the impact of deviations between the theoretical positions of the parts of the connection and their as-erected positions. Columns in multi-storey steel frames are generally H sections , predominantly carrying axial load. When the stability of the structure is provided by cores, or discreet vertical bracing, the beams are generally designed as simply supported. The generally accepted design model is that nominally pinned connections produce nominal moments in the column, calculated by assuming that the beam reaction is 100 mm from the face of the column. If the reactions on the opposite side of the column are equal, there is no net moment. Columns on the perimeter of the structure will have an applied moment, due to the connection being on one side only. Typical internal column sizes are given in the table below. 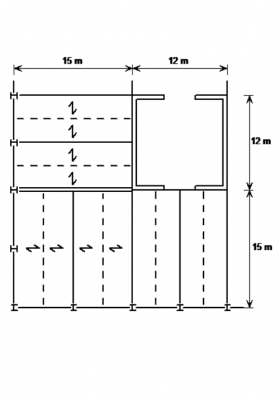 Although small column sections may be preferred for architectural reasons, the practical issues of connections to the floor beams should be considered. It can be difficult and costly to provide connection into the minor axis of a very small column section. A wide range of floor system solutions is available for which typical solutions are given in the table below. Although steel solutions are appropriate for short spans (typically 6 to 9 m), steel has an important advantage over other materials in that long span solutions (between 12 and 18 m) can be easily provided. This has the key advantage of column-free space, allowing future adaptability, and fewer foundations. Floors spanning onto the steel beams will normally be either precast concrete units , or composite floors. The supporting beams may be below the floor, with the floor bearing on the top flange (often known as 'downstand' beams ), or the beams may share the same zone with the floor construction, to reduce the overall depth of the zone. The available construction zone is often the determining factor when choosing a floor solution. Beams within the floor zone are known as shallow floor, slim floor or integrated beams. Beams may be non-composite, or composite. In composite construction shear connectors are welded to the top flange of the beam, transferring load to the concrete floor. Precast concrete units may be used for low rise frames, but composite floors are common in both low rise and high rise structures. The span range of various structural options in both steel and concrete are illustrated in the table below. Long span steel options generally provide for service integration for spans of over 12m. Cellular beams and composite trusses are more efficient for long span secondary beams, whereas fabricated beams are often used for long span primary beams. For estimating purposes in the design of office buildings, representative weights of steel may be used for buildings of rectangular plan form. These quantities will increase significantly for non rectangular or tall buildings or for buildings with atria or complex façades. The approximate quantities are presented in the table below, and are expressed in terms of the total floor area of the building. They do not include the steelwork used in the façades, atrium or roof. Further guidance on estimating steel quantities and cost is available. The construction programme will be a key concern in any project, and should be considered at the same time as considering the cost of structure, the services, cladding and finishes. The structural scheme has a key influence on programme and cost, and structural solutions which can be erected safely, quickly to allow early access for the following trades. Increasingly, structures are constructed on 'brownfield' sites, where earlier construction has left a permanent legacy. In city centres, a solution involving fewer, albeit more heavily loaded foundations are often preferred, which lead to longer spans for the superstructure. The number of cranes on a project will be dominated by the site footprint, the size of the project and the use of additional mobile cranes. Multi-storey structures are generally erected using a tower crane, which may be supplemented by mobile cranes for specific heavy lifting operations. In city centre projects, tower cranes are often located in a lift shaft or atrium. Most large office-type structures require air conditioning or 'comfort cooling', which will necessitate both horizontal and vertical distribution systems. The provision for such systems is of critical importance for the superstructure layout, affecting the layout and type of members chosen. See SCI P166. 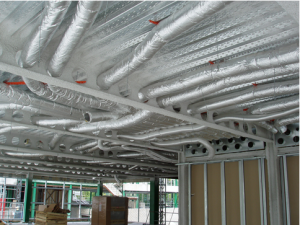 The basic decision either to integrate the ductwork within the structural depth or to simply suspend the ductwork at a lower level affects the choice of structural member, the fire protection system, the cladding (cost and programme) and overall building height. Other systems provide conditioned air from a raised floor. Single storey buildings use steel framed structures and metallic cladding of all types. Large open spaces can be created, which are efficient, easy to maintain and are adaptable as demand changes. Single storey buildings are a 'core' market for steel in the UK. Single storey buildings tend to be large enclosures, but may require space for other uses, such as offices, handling and transportation, overhead cranes, etc. Therefore, many factors have to be addressed in their design. Increasingly, architectural issues and visual impact have to be addressed and many leading architects are involved in the design of modern single storey buildings . The development of a design solution for a single storey building, such as a large enclosure or industrial facility is more dependent on the activity being performed and future requirements for the space than other building types, such as commercial and residential buildings. 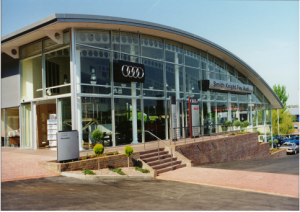 Although these building types are primarily functional, they are commonly designed with strong architectural involvement dictated by planning requirements and client 'branding'. To enable the concept design to be developed, it is necessary to review these considerations based on the type of single storey building. For example, the requirements for a distribution centre will be different to a manufacturing facility. A review of the importance of various design issues is presented in the table on the right for common building types. Modern single storey buildings using steel are both functional in use and are designed to be architecturally attractive. Various examples are presented below together with a brief description of the design concept. The basic structural form of a single storey building may be of various generic types, as shown in the figure below. The figure shows a conceptual cross-section through each type of building, with notes on the structural concept, and typical forces and moments due to gravity loads. [top]Simple roof beam, supported on columns. The span will generally be modest, up to approximately 20 m. The roof beam may be pre-cambered. Bracing will be required in the roof and all elevations, to provide in-plane and longitudinal stability. A portal frame is a continuous frame with moment resisting connections to provide stability in-plane. A portal frame may be single bay or multi bay. The members are generally plain rolled sections, with the resistance of the rafter enhanced locally with a haunch. In many cases, the frame will have pinned bases. Stability in the longitudinal direction is provided by a combination of bracing in the roof, across one or both end bays, and vertical bracing in the elevations. If vertical bracing cannot be provided in the elevations (due to industrial doors, for example) stability is often provided by a rigid frame within the elevation. Truss buildings generally have roof bracing and vertical bracing in each elevation to provide stability in both orthogonal directions. The trusses may take a variety of forms, with shallow or steep external roof slopes. A truss building may also be designed as rigid in-plane, although it is more common to provide bracing to stabilise the frame. Built-up columns (two plain beams, connected to form a compound column) are often used to support heavy loads, such as cranes. These may be used in portalised structures, but are often used with rigid bases, and with bracing to provide in-plane stability. External or suspended support structures may be used, but are relatively uncommon. Portal frames are considered to be a highly cost-effective way to provide a single storey enclosure. Their efficiency depends on the method of analysis, and the assumptions that are made regarding the restraint to the structural members, as shown in the table below. The reasons for choosing simple beam structures, portal frames or trusses are shown in the table below. 'Built-up' or double layer roofing spanning between secondary members such as purlins. Composite panels (also known as sandwich panels) spanning between purlins. Deep decking spanning between main frames, supporting insulation, with an external metal sheet or waterproof membrane. Sheeting, orientated vertically and supported on side rails. Sheeting or structural liner trays spanning horizontally between columns. Composite or sandwich panels spanning horizontally between columns, eliminating side rails. Metallic cassette panels supported by side rails. Different forms of cladding (including vertically and horizontally orientated sheets) may be used together for visual effect in the same façades. Brickwork is often used as a 'dado' or 'dwarf' wall below the level of the windows for impact resistance. An eaves height (base to rafter centreline) of between 5 and 15 m (7.5 m or more is commonly adopted). The eaves height is determined by the specified clear height between the top of the floor and the underside of the haunch. Members are I sections rather than H sections, because they must carry significant bending moments and provide in-plane stiffness. Haunches are provided in the rafters at the eaves to enhance the bending resistance of the rafter and to facilitate a bolted connection to the column. Small haunches are provided at the apex, to facilitate the bolted connection. The eaves haunch is typically cut from the same size Standard open sections|rolled section as the rafter, or one slightly larger, and is welded to the underside of the rafter. The length of the eaves haunch is generally 10% of the span. The length of the haunch means that the hogging bending moment at the 'sharp' end of the haunch is approximately the same as the maximum sagging bending moment towards the apex, as shown in the figure below. The end frames of a portal frame are generally called gable frames. Gable frames may be identical to the internal frames, even though they experience lighter loads. If future extension to the building is envisaged, portal frames are commonly used as the gable frames, to reduce the impact of the structural works. A typical gable frame is shown in the figure below. In-plane stability is provided by frame continuity. In the longitudinal direction, stability is provided by vertical bracing in the elevations. The vertical bracing may be at both ends of the building, or in one bay only. Each frame is connected to the vertical bracing by a hot-rolled member at eaves level. A typical bracing arrangement is shown in the figure below. The gable columns span between the base and the rafter, where the reaction is carried by bracing in the plane of the roof, back to the eaves level, and to the foundations by the vertical bracing. If diagonal bracing in the elevations cannot be accommodated, longitudinal stability can be provided by a rigid frame on the elevation. For economic design , restraints to the rafter and column must be considered. 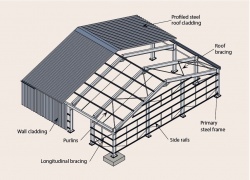 The purlins and side rails are considered adequate to restrain the flange that they are attached to, but unless special measures are taken, the purlins and side rails do not restrain the inside flange. 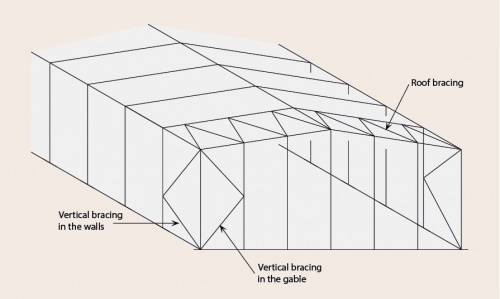 Restraint to the inside flange is commonly provided by bracing from the purlins and side rails, as shown in the figure below. The bracing is usually formed of thin metal straps, designed to act in tension, or from angles designed in compression if bracing is only possible from one side. The arrangement of restraints to the inside flange is generally similar to that shown in the figure below and in all cases, the junction of the inside face of the column and the underside of the haunch must be restrained. A typical eaves connection is shown in in the figure below. In almost all cases a compression stiffener in the column (as shown, at the bottom of the haunch) will be required. 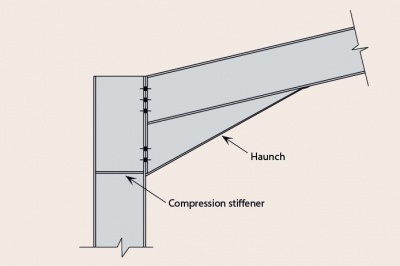 Other stiffeners may be required to increase the bending resistance of the column flange, adjacent to the tension bolts, and to increase the shear resistance of the column web panel. The haunch is generally fabricated from a similar size beam to the rafter (or larger), or fabricated from equivalent plate. Typically, the bolts may be M24 8.8 and the end plate 25 mm thick S275. A typical apex connection is shown in the figure below. The apex connection primarily serves to increase the depth of the member to make a satisfactory bolted connection. 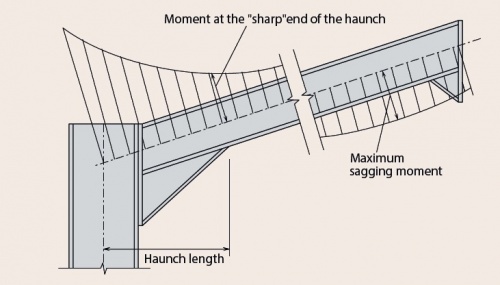 The apex haunch is usually fabricated from the same member as the rafter, or from equivalent plate. Typically, the bolts may be M24 8.8 and the end plate 25 mm thick S275.